Sabrina Rubich shows her SNAP balance. 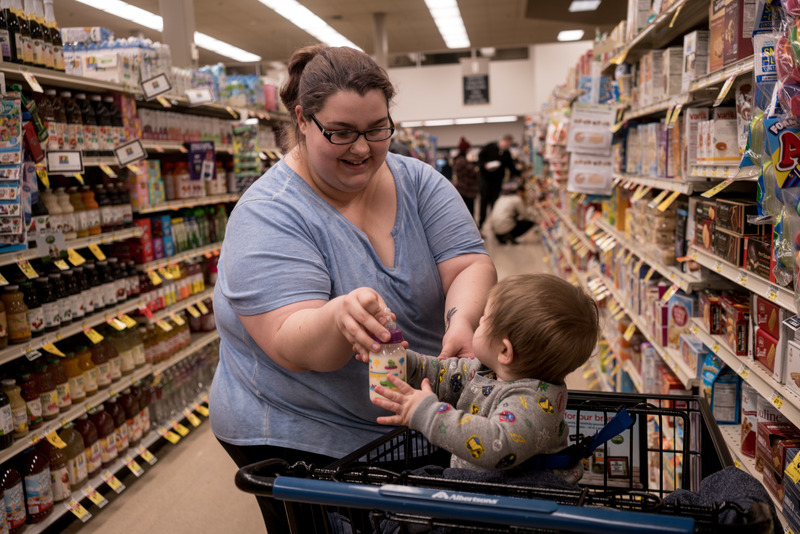 Sabrina Rubich shopped for milk, bananas and other basics this week at an Albertson's grocery store in Missoula, Mont., with her nine-month-old son, Kenny. When she got to the checkstand she paid for some of her groceries with money from the USDA's Supplemental Nutrition Assistance Program, or SNAP—which is issuing its February payments early. 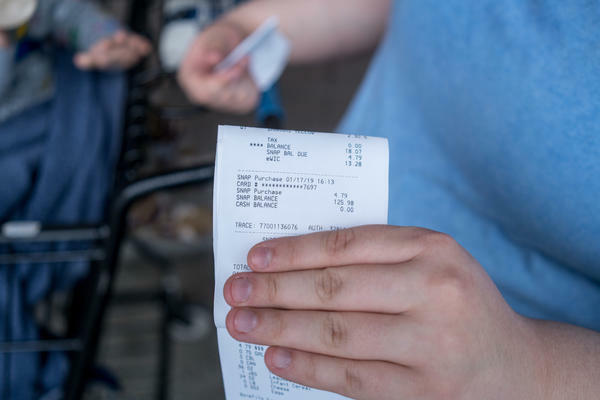 Rubich is one of about 39 million people who are now spending their SNAP payments not knowing when the next one will come due to the federal government shutdown. When she first heard SNAP benefits were coming two weeks early and would have to last until at least the end of next month, Rubich thought, "no they can't be doing that." Then she got a text about it. "And sure enough, checked my balance on the app and was like, 'Oh my god. This is real.'" Sabrina Rubich and her 9-month-old son, Kenny, shop for milk and bananas using their newly issued SNAP benefits. Rubich works full-time at an AT&T call center, and her wife stays at home with their two children. SNAP benefits vary based on income; Rubich and her family get $158 a month. She says it's helping them afford groceries while they climb out of debt. Rubich is making extra food bank trips to hold off as much as possible on spending the money that just dropped, until the beginning of February—especially because she doesn't know if the money for March will come in time. "I am losing sleep over this, man," Rubich says. The Department of Agriculture funding for SNAP expires this weekend. Lorianne Burhop, chief policy officer at Montana Food Bank Network, says her biggest concern right now is making sure recipients understand their benefits are early, and not extra. Many families depend entirely on SNAP for their food. And even in a normal month, Burhop says the money doesn't always last long. "A lot of people end up skipping meals, going without in those last couple weeks of the month," Burhop says. So Montana food banks are doing more to fill some gaps, and the state is calling SNAP recipients and sending out fliers to make sure people know the payment they just got has to last until March. "If the shutdown continues, we all have questions about what will happen in March and potential months beyond that," says Jamie Palagi, administrator of the human and community services division of Montana Department of Public Health and Human Services. Palagi says the USDA advised the state to keep taking applications for SNAP. If the government re-opens soon enough, the next payment would be issued the first week of March. Copyright 2019 Montana Public Radio. To see more, visit Montana Public Radio. People who get grocery money through the Supplemental Nutrition Assistance Program are getting their benefits for next month now. The federal program that used to be called food stamps, now called SNAP, has issued its last payment to states until at least March while the government is shut down. People who use that money are spending it without knowing when the next payment will come. Montana Public Radio's Nick Mott reports. NICK MOTT: Sabrina Rubich is shopping for milk, bananas and other basics with her 9-month-old son, Kenny. SABRINA RUBICH: I get it. You're, like, full of stranger danger. I get it. It's all good. RUBICH: No. They can't be doing that. And then I got a text today and, sure enough, checked my balance on the app. And I was, like, oh, my God. This is real. MOTT: She says her family's making extra food bank trips to save the money that just dropped until the beginning of February, especially because she doesn't know if the money for March will come in time. RUBICH: I am losing sleep over this, man. MOTT: The Department of Agriculture funding for SNAP expires this weekend. Lorianne Burhop, chief policy officer at Montana Food Bank Network, says her biggest concern right now is making sure recipients understand their benefits are early and not extra. Many families depend entirely on SNAP for their food and, even in a normal month, the money doesn't always last long. LORIANNE BURHOP: A lot of people end up skipping meals, going without in those last couple weeks of the month. MOTT: She says Montana food banks are doing more to fill some gaps. And the state's calling recipients and sending out fliers to make sure they know the payment they just got has to last. With the government shut down, what's next? JAMIE PALAGI: I think that's the question on everybody's mind, and I don't have an answer for it. MOTT: That's Jamie Palagi of the Montana Department of Public Health and Human Services. PALAGI: If the shutdown continues, we all have questions about what will happen in March and potential months beyond that. MOTT: Palagi says the USDA advised the state to keep taking applications for SNAP. If the government reopens soon enough, the next payment would be issued for the first week of March. For NPR News, I'm Nick Mott in Missoula. Transcript provided by NPR, Copyright NPR.